Among the many young ensembles creating action-packed music within Seattle’s productive jazz and creative music scene, the Syrinx Effect is a standout. Playing (usually) without a rhythm section, the soprano sax-trombone duo draws propulsive energy from the air like a wind turbine. The group’s second release, out this month, channels that energy into a tuneful and confident set of composed pieces, making Snail Songs a nicely contrasting pair with last year’s gnarly and sweet, a set of unvarnished free improvisations. 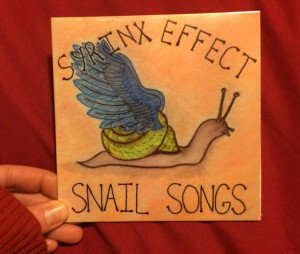 Moods on Snail Songs range from bouncy to becalmed, and generally more sweet than gnarly. Olson’s lovely “Respired by” has Siegel stretching out in a breathy, bluesy solo, then slowly building up a buzzing, didgeridoo-like drone, before both players come together for the tune’s main theme. In Siegel’s graceful closer “Lonesome and the Moonbuggy,” a gently swinging duet gradually dissolves into a sundrenched pool of prismatic harmonies. Both Siegel and Olson are members of several other ticketworthy performing groups (including Wayne Horvitz’s Royal Room Collective Music Ensemble), so there is no shortage of opportunities to catch performances of these rising lights of the Seattle jazz scene. But a Syrinx Effect gig is worth seeking out on its own–not to mention Snail Songs. Previous Previous post: Hello, Climate Solutions!